Nissan CEO Carlos Ghosn broke up keiretsus; suppliers responded with price fixing, industry insiders say. TOKYO -- To hear auto industry insiders in Japan, the country's problems with bid rigging began to spiral in the early 2000s. Or, more specifically, with the arrival of Carlos Ghosn, the cost-cutting CEO who parachuted into a nearly bankrupt Nissan Motor Co. and blew up the carmaker's ossified supplier network. The keiretsu system of supplier families organized around a given automaker was the time-honored tradition here. And Ghosn was among the first to wonder aloud whether it was smarter to choose the lowest bidder than a preordained favorite. 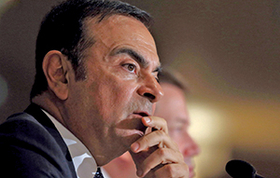 The upheaval was dubbed by many "the Ghosn Shock." "Mr. Ghosn ordered stricter bidding for selecting auto parts," said a government official connected to the industry. "Before that, automakers had cozy relations with keiretsu companies. They didn't need to compete so hard against each other." Suppliers balked at the harsh new reality. It was especially tough for small companies that couldn't compete. But, according to industry insiders in Japan, they found a workaround through bid rigging, which divvied up business according to existing market share. It guaranteed everyone, even the marginal players, a chance to survive. Global automakers soon shifted toward common vehicle architectures, increasing the pressure. The move to common architectures placed a premium on mega-suppliers that could deliver millions of identical parts worldwide for an entire lineup, not a fragmented system of undersized suppliers making different parts for every nameplate. As the dodgy bids came in, automakers tended to turn a blind eye, insiders said. Japan's automakers usually owned big shares in keiretsu suppliers; the carmakers had a financial stakein the smaller companies' success. "We have an interest in healthy suppliers," said an executive at one large Japanese automaker, when asked why the car companies acquiesced to price fixing. But there was also the realization that they needed profit-rich suppliers that could invest heavily in new technology and new factories. As Japan's automakers began opening assembly plants overseas, they leveraged that cash-induced loyalty to demand that suppliers follow their international expansion. A certain amount of collusion was tolerated again after the deadly March 2011 earthquake and tsunami battered Japan. The industry was shut down for months when single-source suppliers got hit. The new mantra became "double sourcing" on key parts. It was all but impossible for double-sourcing suppliers to avoid sharing some information, be it specifications or pricing, one supplier said. Non-Japanese suppliers sometimes complain that their designs are handed over wholesale to keiretsu rivals by Japanese automakers. For all these reasons, Japan's automakers have seemed reluctant to sue their price-fixing suppliers for financial damages. "If an OEM seeks compensation, we say in Japan that's like an octopus eating its own legs," said Kimitoshi Yabuki, an antitrust defense attorney in Tokyo who has represented individuals and companies in the bid-rigging crackdown. Yet that doesn't mean automakers don't fight back. They may be twisting arms behind the scenes to get price breaks on future part deals, says Glenn Davis, an antitrust lawyer at HeplerBroom in Saint Louis. They may be reaching confidential settlements with suppliers that never become public. Or automakers may simply eat the extra costs and pass them on to consumers. "It's a bit of see no evil, hear no evil," Davis said. "But big companies can bring class-action lawsuits. And that may come."